NOW UPDATED! This post has been expanded with new cold email tools for 2017. Enjoy! When you’re doing cold e-mail outreach, there comes a point when you realize that you’re spending a whole lot of time doing a lot of repetitive work. Cyrus Roepers would spend his entire morning sending out cold e-mails and follow ups. Many salespeople end up doing the same thing. We have to deal with copying and pasting, constant data entry, regularly going through our inbox, and then copying and pasting again for follow up e-mails. And if we want to increase the volume of e-mails we send out, that means we have to take even more time out of our day to do it. It can get really time consuming. Fortunately, there are some startups that have tackled this problem by offering cold e-mail automation solutions. Close.io lets you track all your e-mails, follow ups, and even cold calls in one place, and you can contact any of your leads with a simple click. Other companies like Persist IQ focus on scaling personalized 1-on-1 communication so you can increase the volume of e-mails you send out without sacrificing quality. These tools can save you valuable hours in your day, help you increase the volume of e-mails you send out, and boost your conversions at the same time. For example, Persist IQ helped Parse.ly send out 5x more e-mails per week while bumping up their reply rate by 10%. In this post, we’ll talk about the best cold e-mail automation tools that will help you completely change the way you do sales. 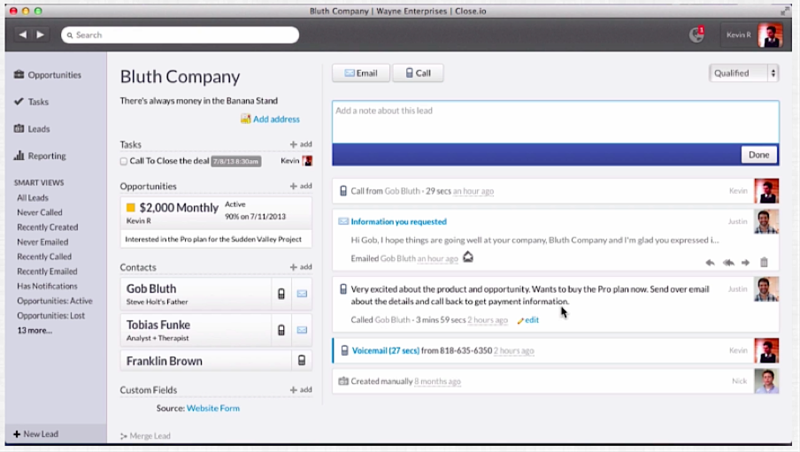 Close.io allows salespeople to send more e-mails, make sales calls, and do away with manual data entry. Their software allows you to track all communication with your leads in one spot. For example, you might send one introductory e-mail to your prospect, then get them on a sales call, then get them on another call with someone higher up, etc. All that communication is automatically tracked within Close.io without the need for any data entry. Besides making calls and sending e-mails through the software itself, you can pre-load templates and the software will automatically populate them with the right information. Close.io makes it really simple for companies to scale their sales teams and make their processes more efficient. In fact, on their homepage, you can see that they’ve had successful customers who have switched over from competitors such as HelloSign. This positive feedback is also reflected in the case studies. If you put more time into crafting the pre-existing templates before uploading them to Close.io, then the scale of the platform could amplify the effects of personalization. Free Bonus Download: Get your free bonus + EXTRA bonus – tons of actionable advice on cold emailing not found in this post! Click here to download it free. 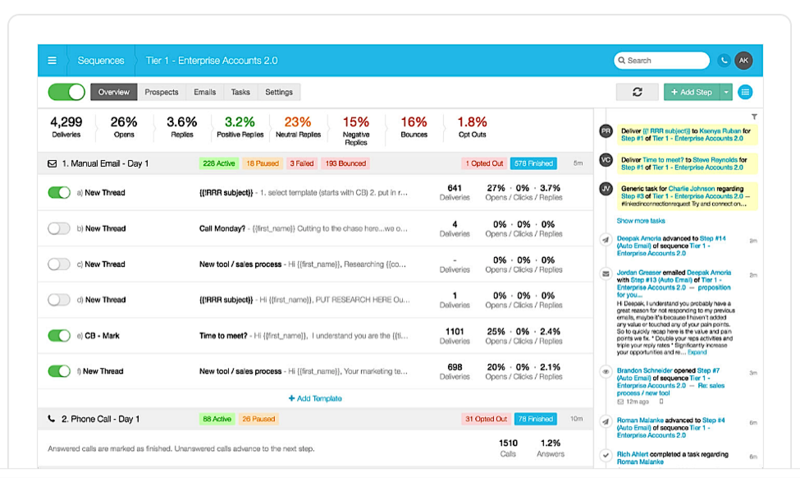 Reply claims to be able to scale your sales outreach while keeping your e-mails personal. Through their system, you can set your own e-mail sequence for follow ups and then A/B test them to maximize your conversions. This saves you time that you could be spending on other, more important things than just data entry or manual organization. HotelsByDay used Reply to save 7 hours a week for each salesperson. They used the software to contact their leads through an automated campaign with an automated follow up sequence. What the the COO of HotelsByDay liked best about Reply is the in-depth data reporting — you can easily see all the stats and indicators of your e-mail campaigns, including active and paused prospects, open rates, delivery, stage of the campaign, bounced e-mails, and more. He also liked the default pausing of the automated follow ups to prospects who have responded to a previous e-mail (so they wouldn’t require follow ups). HotelsByDay have been able to close a whopping 50% of deals after the Reply campaign, while actually saving time each week. Reply also helped People HR generate an additional $15,000 in a few months, along with $5,000 in recurring revenue. The feature that they liked the most was the ability to automatically filter out certain prospects from the series of automated messages based on their behavior. This way, they were able to boost the number of e-mails they sent out while also keeping the interaction personalized. RelocateMe used Reply to get an immediate 37% reply rate after implementing the software. After switching from another CRM to Reply, they were able to stop bulk e-mailing their prospects with the same generic template and instead craft campaigns that were more personalized. They found that they were able to strengthen their current client relationships as well because of the personalized outreach, and thought that Reply’s features made it a worthwhile investment. PersistIQ also claims to be able to scale the “human element” in addition to the volume of sales e-mails that you send out each week. Their system allows you to import your leads while catching duplicate names, launch outbound campaigns that are personalized, and then improve them based on data. One of PersistIQ’s most valuable features is their integrations. For example, they offer bi-directional sync with Salesforce to keep your records up to date without double data entry. They also have a tool that integrates with Google Chrome to allow you to get your prospect’s information from sites like LinkedIn, and then automatically populate them into your e-mail campaigns. This will make your lead gen efforts much more efficient. PersistIQ has a proven record of helping companies who want to scale their cold e-mail outreach while maintaining that personal connection that drives conversions. For example, they helped Lever get a 91% open rate and a 39% reply rate while saving an entire day’s worth of work each week. They also helped Parse.ly boost their reply rates by 10% and increase their e-mail outreach by 5x per week, and helped Backerkit get a 25.1% reply rate and save nearly 2 hours per day. Previously, Backerkit was using a “duct tape” sales solution with multiple CRMs and an Excel spreadsheet. They were able to reduce the time spent on tedious tasks and spend more time using PersistIQ’s features to get more of the right people through the top of their funnel. Gusto saw a 10% open rate increase, a 3x response increase, and a 10x rep productivity increase after implementing PersistIQ. The sales reps at Gusto were previously doing the same tedious activities over 50 times per day which led to lower employee morale and a higher risk of human error. Using PersistIQ, they were able to stop logging activities across multiple databases and manually tracking follow ups. One downside seems to be that PersistIQ doesn’t track cold calls that companies make to their prospects. Because outbound sales often involve both cold e-mails and calling leads, it may be more efficient to have an all-in-one solution that helps scale both cold calling and cold e-mailing. Sendbloom is another tool that helps sales teams scale their cold outreach while keeping e-mails personalized. The main difference between Sendbloom and other similar solutions is their segmentation tool. Sendbloom allows salespeople to send prospects highly relevant e-mails because of the level of granularity they offer when it comes to segmentation. This means, for example, that you’d be able to figure out whether your potential customers are using KISSmetrics or Mixpanel for their analytics. You can even analyze the type of software that your prospects use on their sites so that you can tailor your e-mails based on that information. This is especially useful if your company is trying to get prospects to switch from a highly-established solution to your new software. By understanding the details of what they use, you’ll have a good sense of their current workflow, and you’ll be able to send more personalized messages to increase your likelihood of getting a response. Sendbloom has technology that helps salespeople write more personalized e-mails compared to other similar solutions. This technology analyzes the prospect’s website in depth, so you’ll know the various types of software they use, their web frameworks, and more. Like the other platforms, Sendbloom also offers in-depth data analytics so you’ll know exactly who is opening your e-mails, who replied, which e-mails bounced, and more. Mixmax is a cold email outreach tool that comes with a variety of additional features that salespeople can leverage to close more deals. READ ALSO When Should You Use an Instagram Slideshow? Email tracking. Email tracking is a “table stakes” feature that lets sales reps see when someone opens one of their emails. This makes it easier to gauge response rates, and see where the “friction” in the sales process lies. For example, if your open rates are low but your response rates are high, that means your email is written well but probably needs a different subject line. 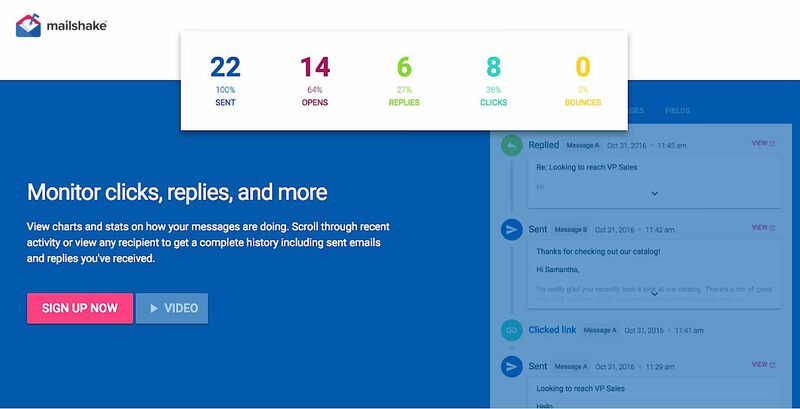 With Mixmax’s email tracking feature, you can see when your email was opened, and how many times. They also have added a geographic location tracker, where you can see which locations your recipients were in when they opened your emails. One click meetings. Appointment setting is a pretty big pain for most salespeople. Once your recipient agrees to get on the phone and chat, there’s usually a long email thread that follows where you and your recipients try to find a time to chat. With Mixmax’s one click scheduling, your recipients can schedule a time in your calendar directly from the email. Send later. Another fairly standard feature Mixmax provides is scheduling emails to be delivered later. For example, if you’re writing emails and catching up on your inbox late at night, you’d want to schedule your emails to be delivered at an appropriate time the next day. This feature can also be used to send yourself reminders if you need it. Mixmax sequences. Sequences are the holy grail of cold email automation. Based on people’s responses and behavior throughout the sequence, you can send them particular emails and exclude them from others. 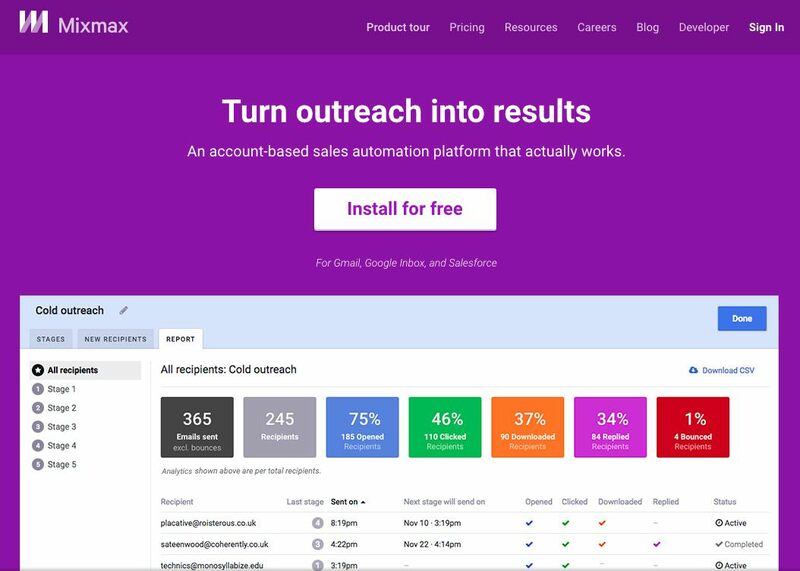 You can automate followups, personalize emails at scale, Mixmax currently integrates with Gmail, Google Inbox, and Salesforce. Advanced embedding. Mixmax allows you to embed things like slide decks, PDFs, and more directly in the email. That way, you don’t need to persuade your recipients to click on the link you want them to click on — they’ll already see it directly in the email. Outreach is an all-in-one system that makes the workflows of sales teams more efficient. This software is probably the most comprehensive tool for sales teams out of everything we’ve covered. Through Outreach, salespeople can make calls to any city or country, automate their cold e-mail outreach, and integrate social media as part of their sales process. They’ll soon be adding an SMS integration feature along with postcard delivery and “swag” delivery to turn fans into advocates. 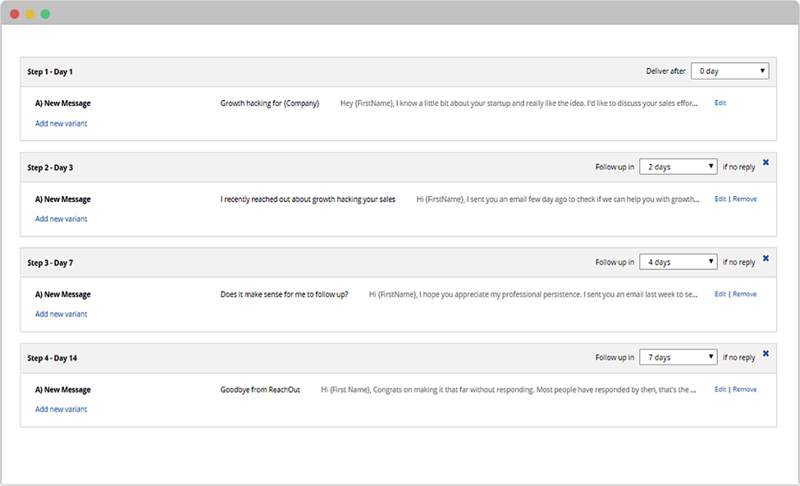 As with Reply, Outreach also allows salespeople to create automated e-mail sequences for their prospects. In addition to all this, Outreach offers data on the personas of the people you’re reaching out to, and other patterns and insights that could help you send more personalized messages to the right people — like measuring e-mail engagement by role within the company. They also have a wide array of integrations for various aspects of the workflow. Outreach helped Virool’s sales reps save an additional two hours per day and help them increase the number of qualified meetings by 3.5x. They called Outreach an “irreplaceable tool” because it not only handled all the minutiae and eliminated the chance of having duplicate e-mails in the system or spamming potential prospects, but because of the peace of mind it gave them! The platform also allows a company to communicate with a vast array of prospects in a way that feels like it’s 1-on-1 because of the comprehensive features and analytics provided. Outreach helped Bizible convert 6% more leads into demo appointments, and helped their leads convert into 2.8% more opportunities. Bizible was able to A/B test their subject lines, e-mail copy, and automated e-mail sequences. They were able to just set a sequence and forget about it instead of constantly thinking about where each prospect was in the sales cycle while copy and pasting e-mail templates. While Outreach does boast a large number of features and integrations, they also have the highest cost. Because of this, they may be a better fit for more established companies with a larger budget. Mailshake is an email outreach tool that makes it easy for you to promote content, build relationships and generate leads – and all you need is a Google account. Mailshake is a great resource for cold emails as it allows you to track emails, automate follow-up messages and hit pause on any email or even the whole campaign. With this tool you can monitor clicks and replies, view charts and stats on the progress of your emails and easily scroll through recent activity to see the full history of any email thread. It now has a new feature called Lead Catcher which you can personalize. For example, if you decide that a lead is only someone who replies to rather than simply opens your email, you can easily adjust the criteria. And when you finally close that lead or even assign it to another member of your team, Lead Catcher will automatically take you to the next one in your queue. Because all your communications, including clicks and opens, with leads are in one convenient place, it’s easy to see the history of messages sent and received and therefore reply with the needed context. Considering that email is the principal channel for lead generation for 89% of marketers, using a tool that makes the whole process easy, organized and authentic is imperative. There are a variety of ways to increase the effectiveness of your cold e-mails. For example, you could increase the number of people you reach out to so you have more volume, create a better subject line so you get a higher open rate, or increase the personalization of each e-mail to boost the likelihood of a response. 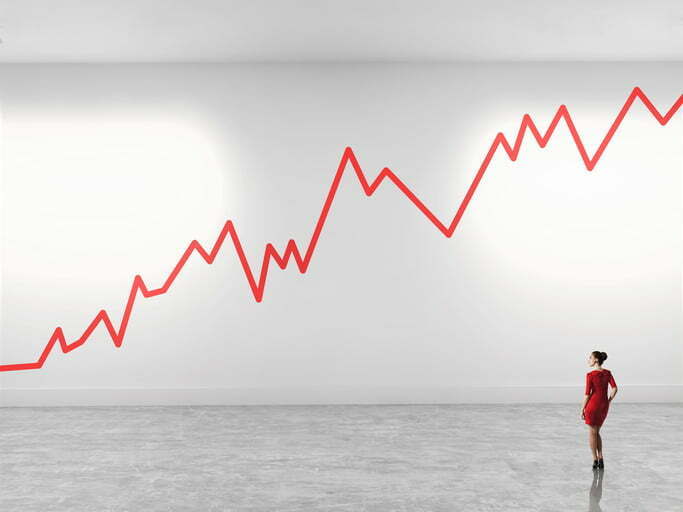 As sales teams get larger and larger, executing on all of these things takes up a lot of time. Sales reps may spend hours longer than they need to on maintaining Excel spreadsheets to remember where the prospects are in the sales cycle or copying and pasting templated e-mails to new prospects. They also have to spend time doing research on prospects to figure out how exactly to personalize the e-mail. All these repetitive tasks can lower employee morale and increase the risk of human error due to the number of steps involved. The sales automation tools we discussed in this post help companies eliminate all of these problems. Close.io makes it really simple for companies to scale their sales teams by allowing you to send more e-mails, track all communication with your leads in one spot, and pre-load templates so the software will automatically populate them with the right information. Sendbloom offers hyper-targeted segmentation so that you can send personalized cold e-mails based on the most granular details about the company you’re reaching out to. Outreach offers a highly comprehensive system to not only send highly personalized e-mails, but also make calls, send text messages or company-branded items, and track them for each prospect. 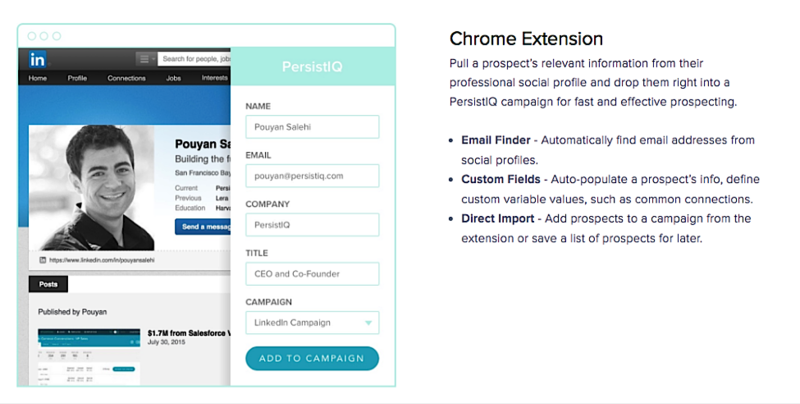 PersistIQ includes a Chrome extension to figure out the right types of information about your prospect through their professional site so that you can quickly send out e-mails instead of digging through pages and pages of details. Reply lets you A/B test e-mail sequences and subject lines so you can figure out exactly which template formats generate the most open rates and responses, and then double down on what works. Mailshake makes it easy to organize your cold email campaigns by using personalized templates, automating follow-up messages and hitting pause on any email quickly – all from your Google account. And its Lead Catcher feature makes tracking and closing leads a breeze. Mixmax makes it easy to schedule emails, create sequences, schedule appointments with your email recipients, and embed graphics like presentations, PDFs, and links in a beautiful way within the email. Now we want to hear from you. How do you plan on scaling your sales team’s cold outreach? Let us know in the comments below! 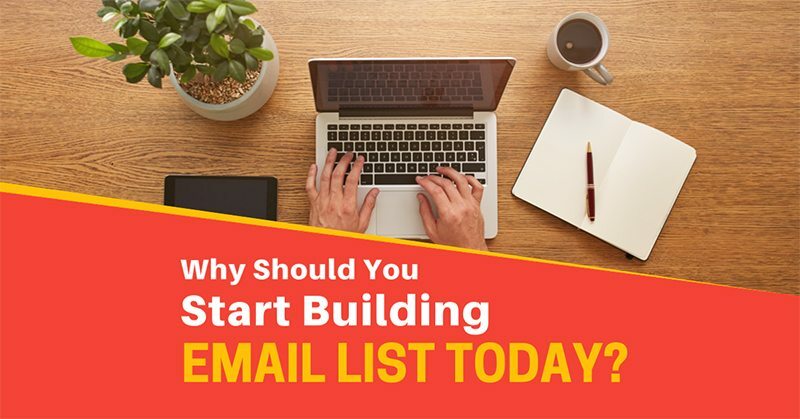 Why Should You Start Building Email List Today?